Inkscape 0.91 Quick Tips - This post I'll share about Inkscape Advance Keyboard Shortcuts Key. We know, Inkscape is a member of the Software Freedom Conservancy, a US 501(c)(3) non-profit organization. A professional quality vector graphics software which runs on Windows, Mac OS X and GNU/Linux. It is used by design professionals and hobbyists worldwide, for creating a wide variety of graphics such as illustrations, icons, logos, diagrams, maps and web graphics. Inkscape uses the W3C open standard SVG (Scalable Vector Graphics) as its native format, and is free and open-source software. Inkscape has sophisticated drawing tools with capabilities comparable to Adobe Illustrator, CorelDRAW and Xara Xtreme. It can import and export various file formats, including SVG, AI, EPS, PDF, PS and PNG. It has a comprehensive feature set, a simple interface, multi-lingual support and is designed to be extensible; users can customize Inkscape's functionality with add-ons. Inkscape project has a growing international user community, and many learning materials exist to help get you started with your creations. Help and support is provided by the community, and there are lots of ways for you to get involved if you want to help improve the Inkscape project. Why You Should Be Using Keyboard Shortcuts? You can increase your productivity and accomplish more tasks by using the keyboard instead of mouse. The time you spend looking for the mouse and then getting the cursor to the position you need is lost time! Reducing the working time by 10 brings you greater efficiency. You can combine the advantages of using the keyboard with those of using the mouse. There are tasks that are much easier done with the mouse, take the example of browsing the web pages and clicking links but at the same time you can use the keyboard to navigate within the page or between tabs. This is amazing image designed by Ridjam. And will be useful especially for beginner. Cool, clean, easy to understand. Hope this design will help you to increase your skill when designing using Inkscape. SVG file available at the last line of this post. 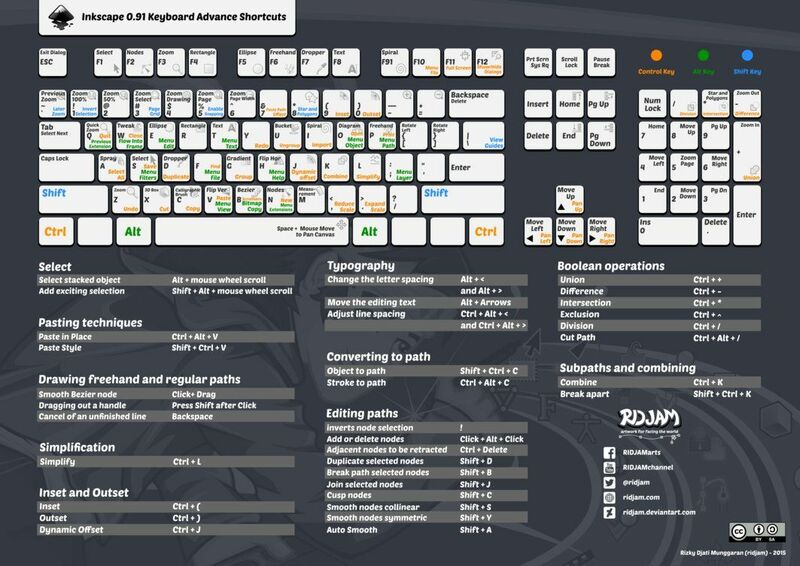 So that's all I can write about Inkscape 0.91 Advance Keyboard Shortcuts that designed by Ridjam. I hope this post be the answer for your question and can be your solution. Hope too you've enjoyed reading this tutorial as much I’ve enjoyed writing it. Thanks for visiting us.